Greatly though it went against the grain, racing had to be put on hold at the beginning of the year due to the huge amount of work needed to get the new web-site up and sorted. 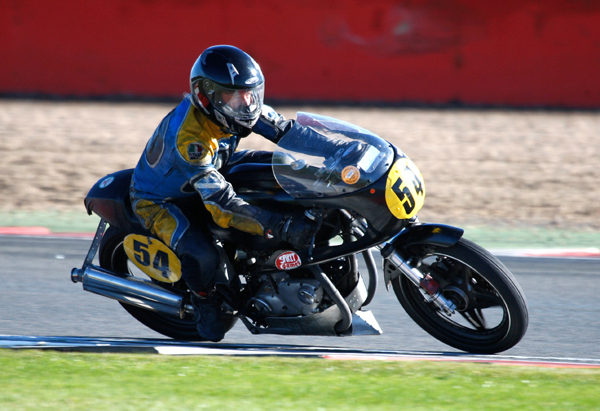 So no entries for the British Historic racing BEARS series for which the Daytona is suited, an especial shame as the competitors are still sorting themselves out and most of the bikes have been potentially beatable. And the CRMC meetings have had to be ignored too, not least because both bikes were in need of some sustained work to get them in a fit state to compete there. The first part of the season has therefore been mainly about getting that work done, and here at least is some good news; the Daytona having been put back on the road for extensive testing, the gearbox is now working beautifully after a thorough fettle and the misfire that plagued it at the end of last year has gone. Thundersprint has usually been the week before our Beer & Pretzels Games Weekend, but due to the Town Hall cocking the dates up the two events clashed this year. Since neither could be missed I had to be as close as possible to being in two places at once, this involved setting up and running the show in Burton all day on Saturday, socialising till midnight, then getting up at 4 a.m. to set off to Northwich. The Cub went like a rocket off the line and I was second fastest in my class after the two practice runs. By the time of the three timed runs in the afternoon the lack of sleep was catching up with me, and I just couldn't get the first bend right. The good news was that I never-the-less got the time down to just under 25 seconds, nearly half a second faster than last year, but the bad news was that everyone else improved their times too and I ended up fourth, my worst ever result. Still, once again the weather had done us proud and a good time was had, a hasty departure got us back in time to help clear up at the Town Hall. This was an opportunity to try both bikes out, the Cub with different gearing and the Daytona with a modern-style silencer which meets the requirements of the noise regulations but which seemed to stop the engine revving freely. It is not restrictive, its main disadvantage should just be the considerable extra weight, but playing around with different carburettor settings was still not getting it right. The bike felt quite good on the ride up to Cadwell Park, until it started holding back just before I got to the campsite. On the track the next day it was still clearly not right. Meanwhile, the Cub, which had been taken up in Jenny's van, was going well, albeit still with an annoying oil leak or two. With the gearing slightly lower than usual it was sitting at its maximum 8000 revs for half the main straight, it seemed quite happy but higher gearing seems a good move. Importantly, unlike last year, it didn't seize the piston. Back to the Daytona, and checking the carbs revealed a loose main jet, and it went much better with that fixed, though still not quite at its best. On the ride home the next day it was sometimes spitting back a bit at medium throttle - on further investigation I found that one of the rubber carb mountings had split over half way round its circumference. Fitting a spare sorted that, but if the split had been developing for a while, that will have affected the carburation, so the needle positions were changed again, and a different pair of main jets were lined up for the next track session where trying the flat-out performance would be more acceptable to the local magistrates. More complicated arrangements due to clashing events - Sally needed to stay in the shop to run a Magic tournament on Saturday, and I needed to get two bikes to Mallory Park with a car and single-bike trailer. 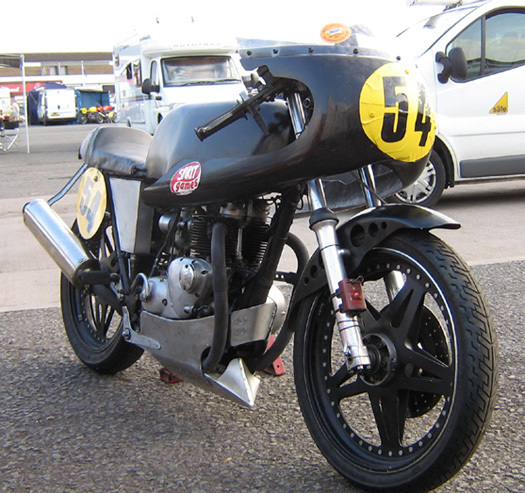 Fortunately Mallory is less than an hour away, so on Friday I splashed through the flooded roads with the Cub on the trailer, got it scrutineered and signing on done, then returned home leaving the bike and trailer in the race paddock. At 7.30 on Saturday morning I was heading back to Mallory on the Daytona, needing to be there by 8.30 without fail for entry to the race paddock which would be shut for several hours thereafter. The weather was just about dry first thing, but the forecast was for something between Noah's flood and Armageddon. Amazingly, however, there was still no rain by the time of my first session around 10 a.m. Excellent. The moment arrived to go out and have some fun, the light turned to green - and my clutch cable snapped. 8 o'clock in plenty of time for booze, band and fireworks, with no need for an early night as the first session on Sunday was not till lunchtime. Just after crossing the finishing line on the last session, the engine went dead and I couldn't pull the clutch in. Finding that the spark plug had unscrewed its central core - a common problem about 90 years ago but a bit strange these days - I screwed it back in place and once again got a push from a marshal to drop it straight into first gear from neutral to overcome the lack of clutch control, getting back to the paddock with more clutchless gear changes. Then it was back home with the bike on the trailer, to investigate the clutch problem, which was down to a ball bearing having broken up at the end of the clutch pushrod, easily solved. So, on the face of it, the bike is ready for Donington next month. We shall see. Two years ago I attended the Beezumph Rally, having missed only one since 1994; it was the year it moved to Anglesey from Cadwell Park in Lincolnshire and the change was greeted with 107mph gusts of wind, causing havoc although a good time was had never-the-less. Last year I could not fit it in with work and racing commitments, this year it was again looking pretty much impossible to get there, but with several reminders recently that you're only young once I was given permission by Sally to leave her womanfully coping with a Magic tournament in the shop while I went off to enjoy myself. Beezumph is primarily a track day - actually two track days, but one would have to suffice for me. The track is well suited to the Daytona, and as it was still in road mode I could ride it there and back to enjoy the journey through Wales as well. Friday morning was spent fabricating a rack to keep the tent perched on the hump of the racing seat, and my old two (at a push) man tent was fished out and aired, not having seen service for many a long year. 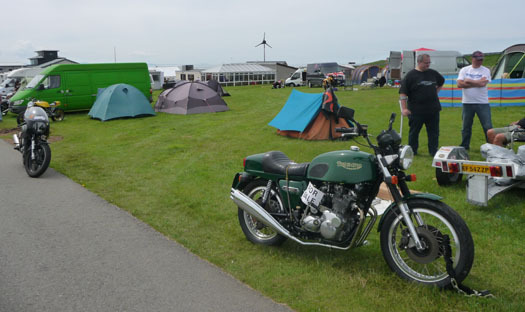 The realisation dawned that the tent is the same age as the bike - it was around 1970 that I bought it. By mid afternoon I was on my way, picking up the A5 around the Welsh border and only being rained on a bit passing Snowdonia, after putting the tent up there was time for food and a few pints of Brains bitter in the clubhouse. The only canvas tent in the field. Saturday morning saw me up bright and early since I first had to track down the organiser, who was flitting here and there, to get a belated ticket before being able to sign on and attend the compulsory briefing. All being achieved in time, the bike went well in two sessions with the racing bikes, the road tyres proving well up to the job on a dry track. In the afternoon I went out in the Quick class, chasing down modern road bikes for a bit of variety. An old chap parked next to my tent observed that mine seemed to be the biggest grin upon post-session helmet removal. Most of the bikes there were much bigger and shinier than mine. So, to stay for BBQ and band or head straight back? The bands have been a bit variable over the years and I have proved hopeless at socialising at past events. The decision was made by failing to track down the organiser for the further ticket required for the food and evening bash, so by 11.20pm I was back home. There is a certain satisfaction in doing a 300 mile round trip, with a thorough thrash in the middle, in 32 hours on a 42 year old bike. And so to the first proper races of the year. The weather held up with only a few spots of rain, this was actually bad news since the only times I have been even half-way competitive at Donington have been in wet or damp conditions. Fortunately there were rather few people watching the sad old git trundling round last. What did go down well was the new belly pan on the Daytona. 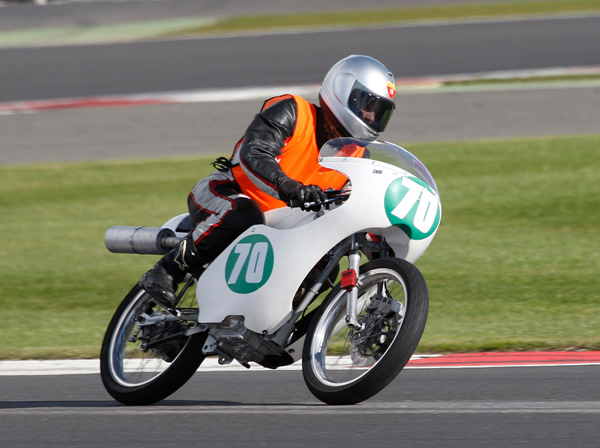 The CRMC scrutineers had decided that as the bike was competing (I use the term loosely here) in the Post-classic class, it should meet those regulations, and therefore needing something to catch the oil should the engine blow. The later engines for which the regs are designed have wet sumps so hold lots of oil, mine is dry-sump so holds a few spoonfuls, making it a bit of nonsense really. So, in the spirit of silliness prevailing, I let my friend Paul loose on the design, resulting in Mad Max meets Classic Racing. Everyone seemed rather impressed, and I was surprised my how many people were familiar with the term "steampunk". The other high points of the weekend were our meal times, Sally had brought lots of food and our barbeque was put to excellent use. There was also a useful experiment in the form of a Honda being lent to me for one race by Adrian Warne, one of the real contenders in the 200cc class. As it was a parade bike for his daughter it looked the same as his race bike but had a standard engine, and a front brake of limited usefulness. I was also, of course, under strict orders not to break it. I therefore expected the lap times to be way down on the Cub, only to find them much the same. Is the Cub really that slow? It would appear so. Oh dear. 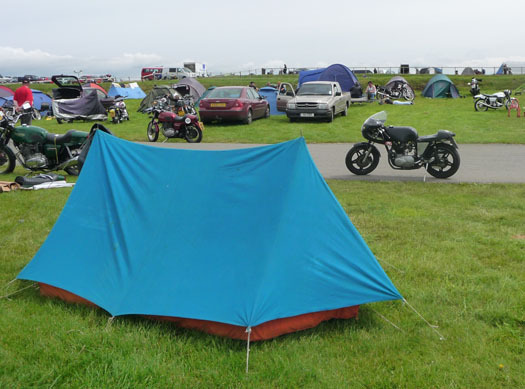 This was my first time at Thunderfest, though not my first time at Darley Moor race track, which is conveniently only half an hour away from home. With just the one bike to take - the Daytona - we borrowed a trailer and used the car, arriving at 8.30 with plenty of time to get unloaded, signed on and scrutineered. 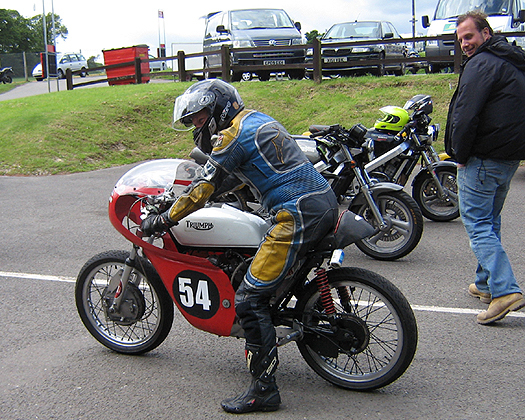 Although the event was part of a full race meeting organised by the Darley Moor club, we had our own paddock area and our practice session was not until after all the modern bikes had had their goes. The clutch was slipping initially but seemed to get better as it warmed up, also an occasional misfire but no apparent reason. Good enough for a semi-competitive event. At about 2pm we went out for several timed laps, after which we all had to submit an average speed which we expected to maintain over about 12 laps later on. The winner would be the person getting closest to the stated average speed. Since the weather forecast was for rain later, that was looking hard to judge. However, amidst the grey clouds there were also clear bits, and almost everyone gambled on it remaining dry, which it just about did - there was even a spot of sunshine while we watched a sidecar race, an unexpected pleasure. Officially, this was not a race, but a time trial, so riders did not need a racing licence and some would not be going at proper racing speeds. Aggressive overtaking was not allowed, so it was all too easy to lose time while waiting for a place to make a polite move. I estimated a time a little faster than the practice times, on the basis that over the larger number of laps everyone would be more spread out, and I should therefore be held up less. It was also an excuse for going hell for leather the whole time. For added fun, the event which, for the sake of argument, we will call a race (except within earshot of officialdom), had a Le Mans start, with the riders sprinting/waddling across the track to mount the bikes held in place by suitable volunteers, engines running. For even more fun, those stating the fastest times started at the back, so there was a mad dash to pass as many slower riders as possible before the first bend. There were a couple of dozen or so starters, and I was third from the back, making it up to 7th place by the end of the first lap. There then followed a most enjoyable 20 minutes getting up to third place, the intervening bikes and riders being faster in some places and slower in others so that we had a good dice, all easing up when catching a slower rider at an inconvenient spot and then manically making up time wherever possible. In the end I was a mile an hour short of the speed I was aiming for so was nowhere near winning the event, but that was never the point, it was a fun day. The enormous gold plastic trophy wouldn't have fitted in the cabinet anyway. Silverstone - a place so vast you don't need a vehicle pass, they have paddock space to spare, so much so that it was easy to get lost on the way to the starting grid. Well, it was for me anyway, though happily I always got there on time. 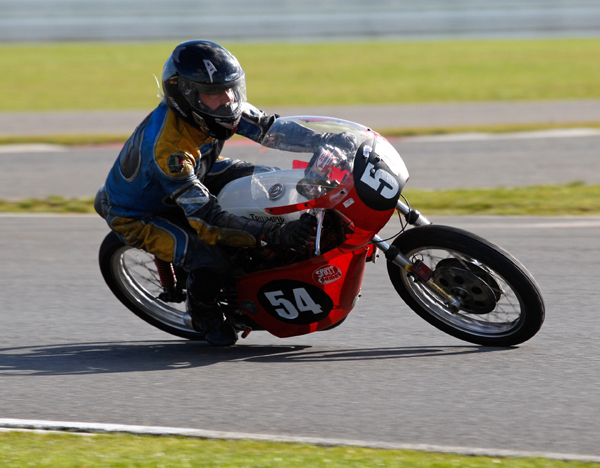 This was a big occasion - not only a rare chance to race at the iconic circuit, but also Jenny's first race on her 200cc Honda which she had been gradually building since last year. To maximise last-minute preparation time, Jenny and Roy were coming to the circuit straight from Leighton Buzzard, not far away, so instead of a lift in Jenny's van Sally and I went by car with the Daytona on the newly acquired trailer. The Cub had gone down to L B a couple of weeks ago and was in the van. The plan was to get all the bikes scrutineered and noise tested on Friday afternoon, but that went out the window when Jenny and Roy didn't turn up till shortly before dark. It quickly got rather cold, the food place shut half an hour sooner than advertised and the bar served no drinkable beer at all, so we made good use of the food and beer we had brought along and had an early night. In the early morning chill my bikes were reluctant to start but were persuaded before long, the main concern was whether Jenny's bike would start since the engine had not been run since she bought it two years ago. Happily there were plenty of people with starter rollers and it was a great relief to hear the bike burst into life, and all the formalities were completed in time for practice. In plenty of time, as it turned out, since we were in practice session 4 and there was a long delay after someone in practice session 2 spread oil all round the track. It was right on the racing line, so we could see where we should be, but didn't want to go there until the oil and cement dust had dissipated after a few races. There was a further delay due to a painful incident in race 1; we finally got our first race after lunch. Jenny and I were both on the back row and the performance of the bikes was similar, but Jenny slowed with clutch and carburation problems so I didn't come last. The important thing was that Jenny finished her first race and got a signature on her licence - a few more of those and she will no longer be classed as a Novice. She had quite a baptism of fire, as the leader of the much faster 350 Gold Stars who were sharing the track with us lapped us with scant regard for courtesy, bouncing Jenny out of the way in an uncalled-for manner which resulted in a bent fairing bracket for Jenny and a bollocking from the officials for him. Meanwhile, up ahead, two of the faster bikes in our small class were busy breaking down, resulting in a third place for me, so I came away with an unexpected award. In the first race for the Daytona it got steadily slower - the timing had slipped, which was at least easy to rectify for the next race. In the Cub's second race one of the bikes that broke earlier had been repaired, but I got ahead of it to get another third place. With yet more incidents in the other races everything was way behind and the second race for the Daytona was rescheduled to Sunday morning. Attempts to fix Jenny's bike were, alas, to no avail. We all piled into the car for a trip into Towcester where the Saracen's Head provided excellent food at bargain prices and good ale, Roy volunteering to drive so that the rest of us could do justice to the refreshments. While we were there the rain hammered down, but it stopped before we got back for a reasonable night's sleep in the van. The weather during the day on Saturday had been pretty good - on Sunday the sun came out quite enthusiastically and we thoroughly enjoyed it. The track, however, was slow to dry out from the evening's soaking, and was still decidedly damp part way round several of the bends. 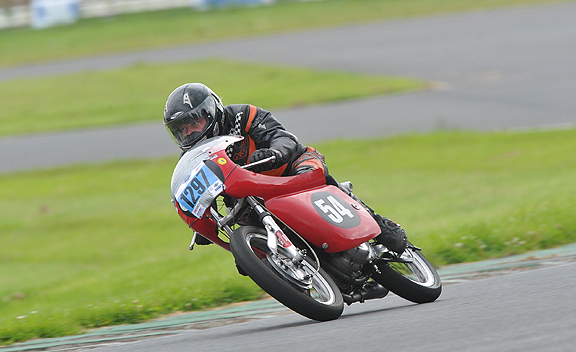 This gave me an advantage over some of the more cumbersome 1100cc bikes that our 500cc class shared the track with, and I beat a couple of the bikes in our class too, but I was still a few seconds off a competitive lap pace. 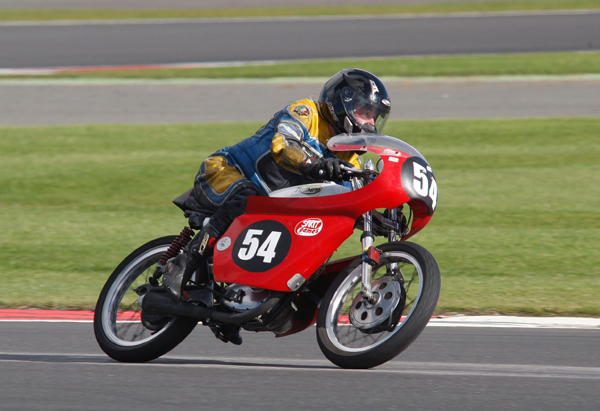 And so to the Classic Race of the Year - could I get on the podium in the 200cc 4-stroke race? No. 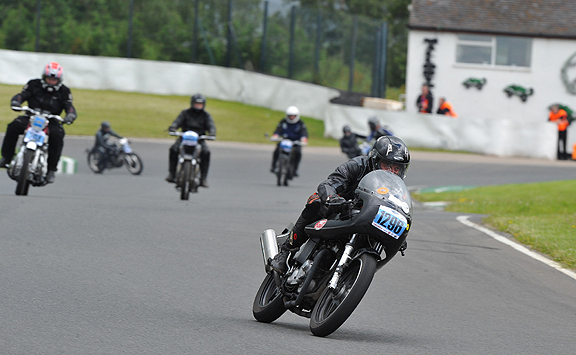 I was getting better round the bends but not yet good enough, the bike I had beaten earlier was back on song. The poor old Cub was being left for dead on the straights by the other 200's, leaving just a couple of the slower 250's to play with. In the now fully dry conditions of the 500 race the more powerful bikes were able to flex their muscles properly, and despite wearing a lot of boot away on one of the bends I was still not fast enough on the others; a failure somewhere in the electrics brought the bike to a halt shortly before the end anyway. But I'd had the Silverstone experience - and the sun was still shining!